The median home value is widely quoted in the press, often as a measure of home price values over time. The measure has intuitive appeal: it's a statistical improvement over the average or mean. 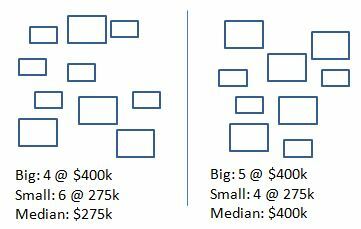 The mean is easier to skew upwards by a few very large sales, which would have less of an impact on the median. The median value is easy to calculate and compare to historical median values. In the above example, we see a sharp rise in the median home value, driven by the fact that larger homes represented a greater proportion of the total units sold in the second month. The underlying true value of homes was unchanged from month to month. Big homes sold for $400k in both months, and smaller homes sold for $275k in both months. The above example also illustrates one solution for fixing the mix shift problem, while still working with the median. If the data are filtered into smaller subsets of like properties, where each subset has similar properties, the resulting change in the median from the shift of mix will be minimized. Sites like Redfin.com take a stab at this by filtering all sales into homes and condos. Redfin.com also allows the visitor to filter by zip code, neighborhood, and other geographic areas. Both of these actions reduce the distortion created by the median in month-over-month trending. To improve upon Redfin's approach it would be necessary to further homogenize the composition of the group of single family houses. As an example, we could slice the group of single family homes into three MECE (mutually exclusive and collectively exhaustive) groups such as less than 1800 SF (square feet), 1800-2300 SF, and greater than 2300 SF -- and then look at the median within each group. Taken to the limit, this procedure of creating ever smaller groups would involve looking at groups with only one home. The Case-Shiller home value index does just that, comparing only same home to same home over time. Because of Case-Shiller's method, it is not directly distorted by changes in the mix of homes sold, and is considered one of the more accurate measures of home values over time. Next, what about price per square foot?